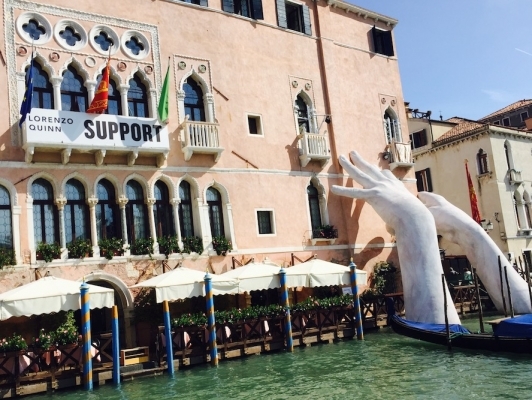 Out of the countless reasons to visit Venice, here is yet another to add to the list: La Biennale. Occurring every two years, this contemporary art show transforms the city into an art lover’s paradise. Running from May 13th to November 26, this year’s show “Viva Arte Viva,” marked the 57th exhibition. The internationally renowned exhibit runs from May to November, every other year on odd years (2017, 2019), alternating with the Biennale of Architecture (held on even years). While the main exhibits are in the Giardini and Arsenale areas, smaller exhibitions, statues and installations can be found smartly placed around the city. The main exhibition areas can easily be reached via public transportation (ACTV stop Aresenale, or ACTV stop Giardini Biennale). Whether you are an art aficionado or just passing through during a visit to Venice, there are many ways to get involved. The fair offers guided tours for visitors (in Italian or English), as well as creative workshops for families. Every week, the artists host an Open Table (Tavola Aperta) to meet visitors over a casual lunch to discuss their works in an open forum. Many of the exhibits themselves encourage active participation, including the “Intuition” show at Palazzo Fortuny. The palazzo holds 4 floors of mixed medium displays. On the ground level visitors can watch video clips, enjoy interactive displays and interact with the installations, and are even invited to take part in the creative process. On the 3rd floor of the ancient palazzo, visitors will find a long table filled with clay balls, and are encouraged to mold their own ball and add it to the communal table. If you are interested in attending, we at the Italian Concierge suggest you book well in advance. With the international popularity of the event every growing, hotels book up months, even years in advance. A visit to the Biennale can be combined with visits to nearby Milano, Lake Como, Lake Garda, or even Florence, Rome, and Tuscany. Venice will host the Biennale of Architecture in 2018, and the Biennale of Art again starting May 2019. Whether you are an aficionado of art, architecture, or simply luxury travel, contact the Italian Concierge to start planning your dream trip to Italy. Accessibility: The Aresnale exhibition area is fully accessible thanks to wheelchairs ramps, elevators and uniform outdoor itineraries. The Giardini area has ramps and stair lifts but some areas may not be accessible.